This study aims to explore possible risk factors for child maltreatment in Vietnam by investigating the association of child and family factors with different types of child maltreatment (i.e., sexual abuse, physical abuse, emotional abuse, witnessing parental conflict, and neglect) and the occurrence of multiple types of child maltreatment. Cross-sectional data of 1,851 secondary and high school students aged 12 to 17 years (47.3% boys) in four provinces of Northern Vietnam were obtained using self-report questionnaires. Results indicated that the likelihood of emotional abuse, witnessing parental conflict, and experiencing multiple types of child maltreatment during lifetime increased with age. Boys had a higher risk than girls on lifetime sexual abuse, and past year and lifetime physical abuse. Living in a single parent family was the risk factor related to most types of child maltreatment including lifetime sexual abuse, neglect, and multiple types of child maltreatment, and both past year and lifetime witnessing parental conflict. Interestingly, low socioeconomic status (SES) and parental unemployment were associated with a decreased risk on experiencing emotional abuse in the past year and during lifetime, respectively. “Tiger parenting,” a parenting style observed frequently in East Asian parents, may be more common in families with high SES and might explain this finding. This study highlights the importance of prioritizing single parent families in parenting programs and implementing child maltreatment interventions early because of the risk on child maltreatment increased with age. 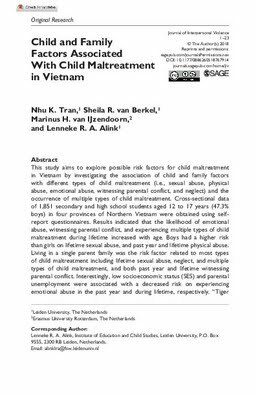 More research on emotional abuse and “Tiger parenting” in Vietnam could clarify the association of emotional abuse with high SES and parental employment. Finally, the underlying mechanisms of the risk factors in Vietnam should be studied more to inform interventions.